Natural Vitamin K2 – MenaQ7™ contains pure MenaQ7™, the superior form of vitamin K for optimum bioavailability and delivery to the body. MenaQ7™ is purified from natto, a traditional Japanese breakfast food made of fermented soybeans that is naturally rich in vitamin K2. Vitamin K, specifically the vitamin K2 form plays an important role in keeping calcium in your bones — and out of your arteries. Acting through what’s known as a Gla protein calledosteocalcin, vitamin K allows calcium to bind the bone matrix while the body is building new bone. A similar molecule known as matrix Gla protein is synthesized by vascular smooth muscle cells. In contrast to osteocalcin, matrix Gla protein prevents calcification of soft tissue, meaning it stops calcium from being deposited in the walls of your blood vessels (arterial calcification) — a very good thing for anyone worried about heart health. If you take Coumadin, Heparin, or another anti-coagulant you should consult your physician before taking vitamin K2 supplements. 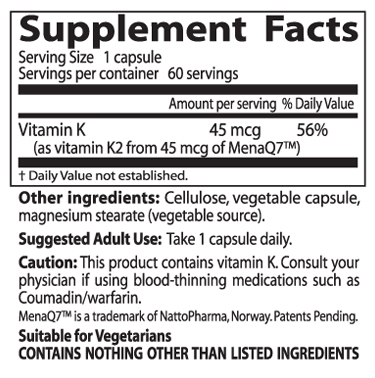 Vitamin K2 helps normal coagulation of blood. High levels of K2 do not cause abnormal blood clotting. You should not be concerned about taking levels of 45 mg/day or less, as numerous Japanese studies have shown even this high level is safe for adults. Most vitamin K2 supplements offer 45 - 150 micrograms per day.